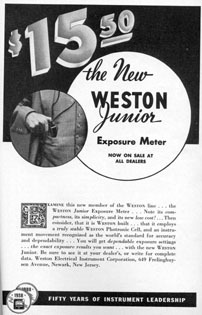 This was Weston's first attempt at a simpler meter for the amateur market. Unlike its big brother (the Senior), this one didn't have a calculator dial. You simply pointed it and read the meter face. It was their first attempt at a "direct reading" meter. The subsequent 800-series models would continue and refine this. Unfortunately, exposure just isn't that simple. They had several different scales on the meter face, so you had to figure out which was the proper one to read. That was fine if you were an enthusiast and knew something about exposure. It wasn't so good if you just wanted to take some photos at the family picnic with your folding camera and that's it. This is one of my favorite kinds of meters because it has a little bit of background; it's not just a curio in a cabinet. The previous owner wrote, "My grandfather was an avid amateur photographer, and you will see his initials on the meter - Clarence Wellesley Greathead, born 1909 Delaware County, PA, died 1989, Philadelphia, PA. He has several patents from his career as a welder/metalsmith, and traveled the entire country during the depression. 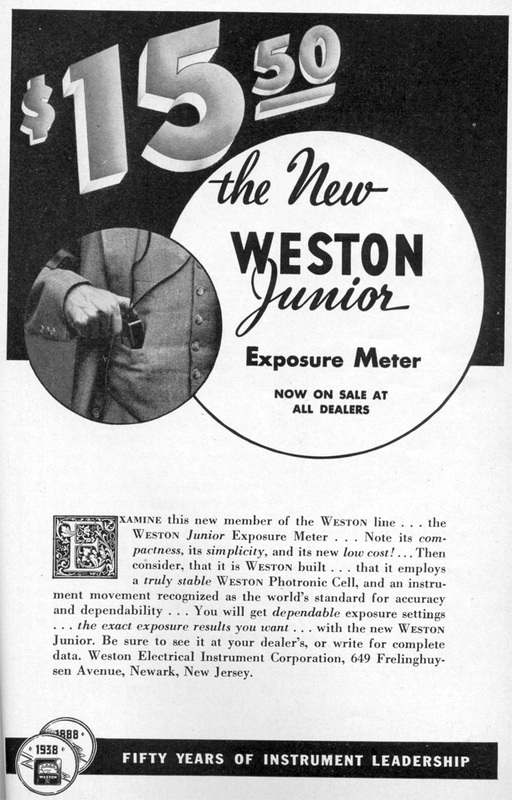 [This meter and the Expophot] saw a lot of interesting light." I like the idea that I'm preserving a little piece of history. For instance, the fact that the initials are carved on the case can be looked at two ways. 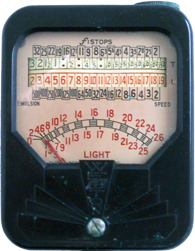 First it means that the collectable value is lowered because it's marred, but it also means someone cared enough about the meter that he wanted to personalize it. It was important and valued by the owner—not just another piece of junk rattling around in his equipment bag.